Kitting out your baby's nursery can be a lot of fun, as tiring as it is. With so many great themes and accessories available for your baby room you can be sure there is something for everyone. The key to a good looking baby nursery is to plan, plan, plan. Once you have some ideas of what look you are trying to achieve then you need to sit down and plan exactly what you want and where you want to put it. If you are stuck for some ideas or want some handy hints to help you along the way then check out below for some great baby nursery decor ideas. • Add a daybed: If you room is large enough you want to consider getting a daybed for your baby nursery. It will be an extra place to sleep if you are nursing or your baby is ill and you can get various baby bedding sets that will look fantastic and can be matched to the rest of the room. • Make it kid-friendly: Babies make a lot of mess and one that is definitely worth doing is investing in products that are both washable and durable to save you money down the line having to replace items. • Graphics: Large stick on graphics will transform any wall in a matter of seconds. They can be picked up in a range of styles and are relatively cheap too. • Choose soft colors: Newborn babies can only see black, white and gray at first. As their sight develops they learn to recognise red first, but avoid this color as can be confusing for babies. 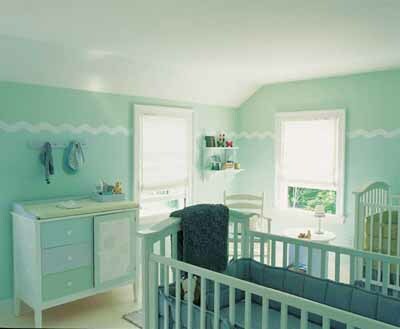 Pastel colors are good for nurseries as they have a soothing effect. • Storage: Storage is something that you will become very grateful for as a parent as you begin to accumulate more than the mall itself for your baby. Storage facilities come in a range of options from shelves, to racks, to boxes and as well as providing somewhere safe to put all your extra baby linen they make a great accessory to the baby room also. • Accessibility: You want to ensure that everything is easy to reach within the nursery, but for you, not the baby. A good open style changing table provides extra storage within arms reach. • Lighting: Providing ambient lighting in your baby nursery will help to calm them. Also, adding a dimmer switch is a good way to get them used to the dark gradually or change the mood when reading a bedtime story. Or, instead of a dimmer, night lights can also be good as don't use much electric and some can also play music!